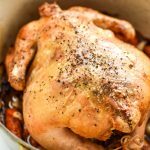 My Simple Whole Roast Chicken is incredibly juicy, flavorful, and perfect for Sunday dinner! I’ve created a Whole30 & Paleo version of my favorite whole roast chicken recipe, and it’s just as good as the original! Start with the chicken: Remove excess fat and tail feathers, then pat the outside of the chicken dry with a paper towel. Let the chicken sit at room temperature while you prepare the roasting pan and vegetables. Preheat the oven to 425 degrees F.
Prepare the roasting pan: To a roasting pan or Dutch oven, add carrots, onion, 1 tablespoon of thyme, 1/4 teaspoon each salt & pepper, and avocado oil. Toss lightly until the veggies are covered in oil and seasoning. Prep the inside of the chicken: Place the chicken in your roasting pan or Dutch oven on top of the prepared vegetables. Hold the chicken cavity open with one hand, and liberally season the inside with salt and pepper with the other hand. Stuff the cavity, alternating the lemon quarters, halved garlic head, and sprigs of thyme. Tie the legs together with kitchen string and tuck the wings under the body of the chicken. Ensure the chicken is resting on vegetables and is not directly touching the roasting pan when it goes in the oven. Prep the outside of the chicken: Using your fingers or a pastry brush, coat the outside of the chicken with melted ghee, brushing the top and around all sides of the chicken (except the bottom – no need to move the chicken). Season the outside of the chicken liberally with salt and pepper (about 1/2 teaspoon each salt/pepper). Bake: Roast the chicken for 60-90 minutes, or until the internal temperature in the thickest part of the chicken is over 165 degrees F (I usually check two spots to make sure). My smaller 4.5 pound chickens from Butcherbox usually take around 75 minutes. Rest: Resting the chicken is just as important as the ingredients and cooking method, please do not skip. Remove the chicken to a platter and let the chicken rest for at least 15 minutes, uncovered to keep the skin crisp on top (place the vegetables back in the oven to keep warm). After 15-20 minutes of resting, slice chicken and serve. Store leftover chicken in an airtight sealed container, preferably removed from the bones, for up to 4 days. See notes for my post-chicken dinner process. Post-Chicken Dinner Process: After dinner, I remove ALL the leftover chicken from the bones to make homemade chicken broth. I place all the chicken bones and giblets (if there are any) into my Instant Pot with all the vegetable trimmings/leftovers (carrot ends, onion tops, celery leaves, etc). Add a sprinkle of salt, a couple tablespoons of apple cider vinegar, and then fill it to the limit with purified water. Close the lid, seal the vent, and set it to the SOUP setting for TWO HOURS. Let the pressure naturally release, then strain the liquid and let it cool before refrigerating or freezing for future use. Recipe adapted from Ina’s Perfect Roast Chicken Recipe. Nutrition information estimated with My Fitness Pal, though will vary widely based on what parts of the chicken are consumed in each serving.